Plants dark green, erect, brush-like, 4-8 cm tall, often in groups. Stipe of single cell, attached by rhizoids from basal end, with annular constrictions along whole length, usually covered with encrusting coralline algae. Capitula brush shaped, becoming globose when older, very rarely flattened; comprising branched entangled filaments: basal capitulum cells 160-400 µm in diameter, apical capitulum cells 70-200 µm in diameter.. Stipe cell 2-7 cm long, 400-950 µm in diameter at base, widening to 1300-1650 µm at apex; cell walls markedly stratified. For further details on South African specimens see Coppejans et al. (2005). Recorded from the Port Alfred area to northern Kwazulu-Natal (39-58). Found in mid-lower eulittoral zones and subtidally to at least 15 m, usually in fairly exposed localities. World distribution: Also found in Madagascar, Mauritius, and the east coast of Africa from Mozambique to Somalia. (Guiry & Guiry 2012). However, Leliaert et al. (2007) note that the records from Kenya, Tanzania and Somalia may be referrable to C. auriculata. Type locality: Fort Dauphin, Madagascar (Silva, et al., 1996). Note: According to Leliaert et al. 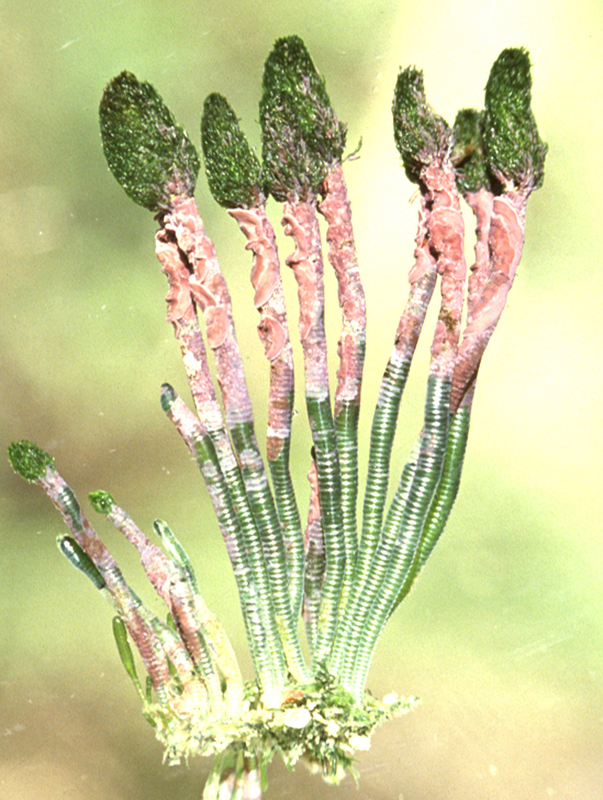 (2007) this species can become auriculate, making it difficult to distinguish from C. auriculata, and these two species are best distinguished by the size of cells of the capitulum. Chamaedoris delphinii, upper stipes covered with encrusting coralline alga. Børgesen, F. 1940. Some marine algae from Mauritius. I Chlorophyceae. Kongelige Danske Videnskabernes Selskab, Biologiske Meddelelser 15(4): 81. Coppejans, E., Leliaert, F., Verbruggen, H. 2005. Green Algae. In De Clerck, O., J.J.Bolton, R. J. Anderson and E. Coppejans, 2005. Guide to the Seaweeds of Kwazulu-Natal. National Botanic Garden of Belgium, Brussels (Scripta Botanica Belgica), pp 40-93. Guiry, M.D. & Guiry, G.M. 2012. AlgaeBase. World-wide electronic publication, National University of Ireland, Galway. http://www.algaebase.org; searched August 2012.